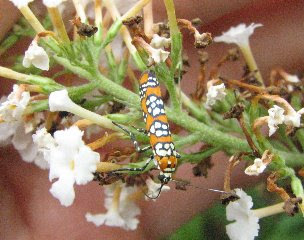 The Ailanthus Webworm Moth (Atteva punctella) is often mistaken for a beetle because of its unusually bright coloring and habit of being on flowers in the daytime. These moths keep their wings rolled up tightly against their bodies, unlike other moths we are used to seeing with wings outspread. Its native habitat is South and Central America where they build communal webs in native trees. Another exotic species imported into the United States from China for the silk industry in the mid 1800's. This moth is of little consequence ecologically but the host plant, Tree of Heaven (Ailanthus altissima) brought along for food is a major invasive noxious weed tree along roadways and everywhere else its seeds and suckers can find disturbed soil in Virginia. View Tree of Heaven. This insect has now spread through most of the United States where the caterpillar stage uses the introduced tree known as Tree of Heaven or Paradise Tree (Ailanthus altissima) for food. This 'Tree of Heaven' has turned out to be anything but heavenly since it is displacing many of our own native trees and is especially difficult to eradicate because of its root structure. The larval (caterpillar) stage of this moth feeds on the leaves, flowers, seeds and even bark of this tree. It will also feed on other deciduous trees and shrubs. The caterpillars make loose webs on their food plants and live inside them. The colorful adult Ailanthus webworm moth pictured here on a Butterfly Bush (buddleia) is a pollinator. They visit flowers of many different species during the daytime. They mate at dawn and lay eggs at dusk producing one generation per year. It is unlikely that it overwinters in our area, but rather migrates here each year.